The Rockin’ R Ranch is in Southern Utah about 3 1/2 to 4 hours south of Salt Lake City, and 4 to 4 1/2 hours northeast of Las Vegas. 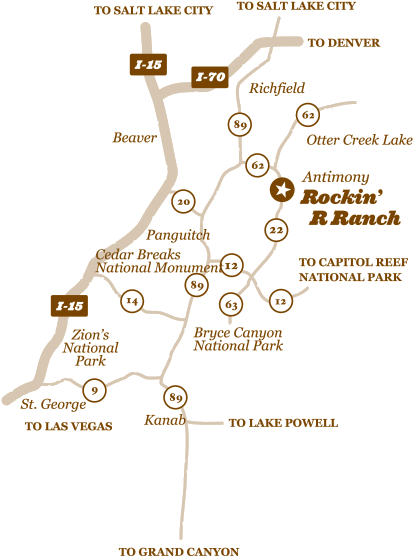 There are a few different routes you can use to get to the Rockin’ R Ranch, as you can see from the map. Following are the routes which we think are the fastest and/or most direct. But feel free to use the other roads. The Rockin’ R is in the Mountain Time Zone. Keep that in mind if you are coming to us from Nevada or other western states, as you will “lose” an hour. Drive south on Interstate 15. Exit at Scipio. Turn southeast on Highway 50 towards Salina. Shortly before Salina turn south at the junction to Aurora on Highway 24. Continue south through Aurora until you intersect with Highway 89. Travel south on Highway 89 for a couple of miles until you travel under Interstate 70. Go westbound on I-70. Exit I-70 at the “Highway 89” and “Panguitch” exit. Go south on Highway 89 through Marysvale and the town of Junction. Just south of Junction, go east on Highway 62 which eventually turns southeast into Highway 22 and into the town of Antimony. The Ranch is on the north end of town, west side of the street. You can’t miss it. The Ranch is in Southern Utah approximately 3 1/2 hours from Salt Lake City. Drive north on Interstate 15 past St. George, Cedar City and approximately 16 miles north of Parowan take the Panguitch exit and go east on Highway 20. Go north on Highway 89 past Circleville. Go east on Highway 62. Continue southeast to Highway 22 into Antimony. The Ranch is on the north end of town, west side of the street. you can’t miss it!!. Please notice the other roads if you choose to go through Zion Canyon or Bryce Canyon first. If your route brings you into Utah on Highway 89 through Kanab, just remain on the road until you reach Highway 62 north of Circleville. The Ranch is in Southern Utah approximately 4 to 4 1/2 hours from Las Vegas. Keep in mind that we are in the Mountain Time Zone. If coming from Nevada, you’ll “lose” an hour. Drive west on Interstate 70. Go past Moab and Richfield. Exit at the “Highway 89” and “Panguitch” exit. The Ranch is on the north end of town, west side of the street. You can’t miss it.